The built in version of the SS 670 contains all of the same great features, just without the cart. Use this type of grill head to recess into a grill island or outdoor kitchen. If you have never cooked on a infrared saber grill, you don't know what you are missing. There is no other grill that gives you the precision type of cooking as infrared, and Saber is the best in the business. Their patented burner system allows for zone style cooking, meaning you can sear a steak at 600 degrees just inches away from delicate Tilapia at 300 degrees. No flare up, no burnt food, just juicy flavorful food every time. The engineers at Saber spared no expense when designing these highly advanced grills, using commercial grade 304 stainless steel, and many porcelain coated components. Built to last and aimed at producing the best cooked food you have ever tasted. Size: 36.75" x 26" x 10.5"
Invite all the neighbors; with the Saber SS 670 NG Built-In Grill and its 895 square feet of cooking surface, you can easily cook for them all! 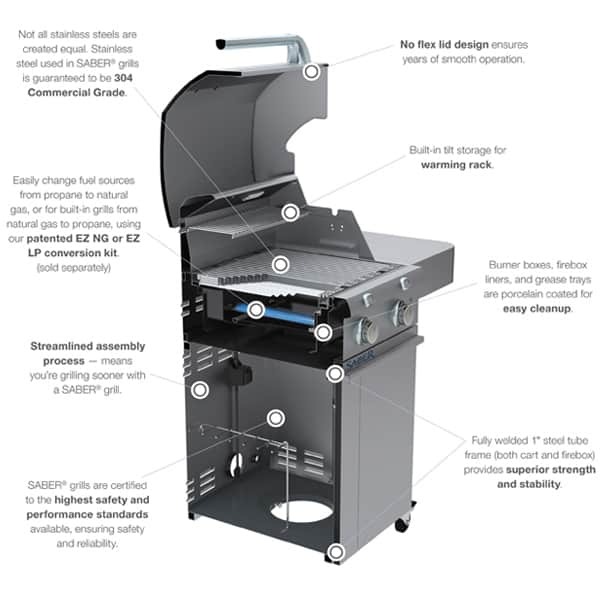 This is the built-in version of Saber’s largest grill, and it includes all the quality and convenience of a free-standing unit. The Saber 670 features patented infrared cooking, even temperatures and no flare-ups to ensure perfect grilling. Saber uses only the highest-grade 304 stainless steel for the firebox, burners and grates. The grill is equipped with independent zonal control, allowing you to cook at different temperatures at the same time; perfect for surf and turf. 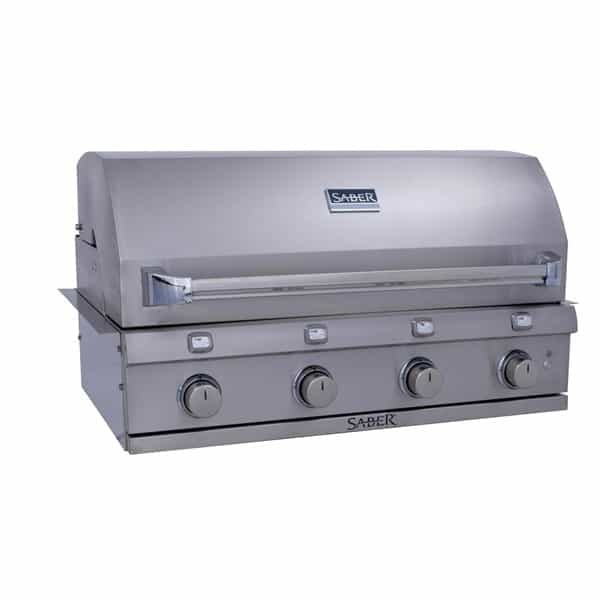 Styled for easy clean-up, the Saber SS 670 NG Built-In Grill has a front access grease tray. It has four 304 stainless steel burners, each equipped with a push-button electronic ignition. This extraordinary unit has an adjustable warming rack that also provides storage and roasting positions. And don’t worry about the sun going down; the Saber SS 670 NG has interior halogen lights! 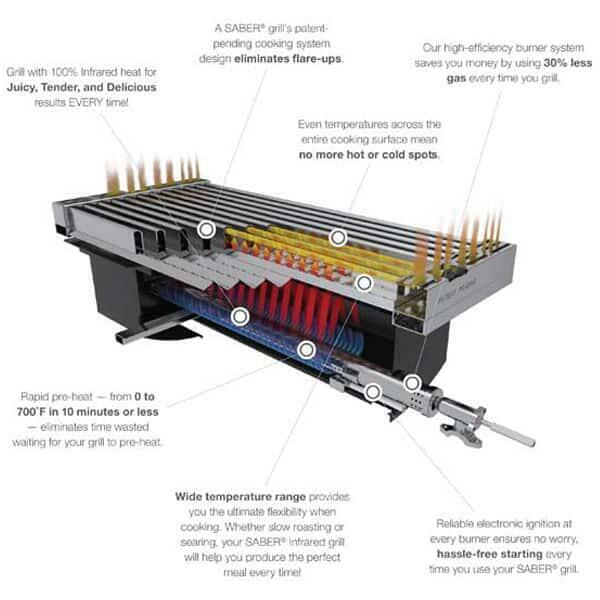 This is a natural gas grill but it can be safely and easily converted utilizing Saber’s EZLP technology. Total Cooking Surface 895 sq. in.